Drain trouble can be the source of lingering disruption throughout any property. Sometimes, it’s tough to figure out what the problem might be – or if there is a problem in the first place – but leaving a damaged drain for too long can end up being very costly to fix. 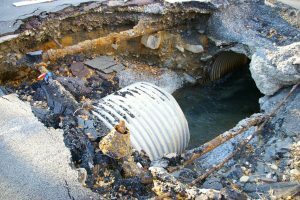 A collapsed drain is on the more severe end of the scale when it comes to drain damage, and requires immediate attention once it has been identified. It definitely helps to know the causes of a collapsed drain, but to help you determine whether or not your drain has collapsed in the first place, we’ve listed some common signs you should be on the lookout for. With a collapsed drain, the flow of water will be heavily disrupted. This can lead to water flowing into the ground surrounding the drainpipe itself. If the pipe has collapsed underneath your home, you might be able to spot signs of damp on the walls or floor. Left unattended, damp can be a serious problem – especially if you’re unable to fight the source. Usually the first sign of a damaged drain is the sudden drop in performance of your drains. Slow or poor drainage suggests a blockage somewhere down the line, but a collapsed drain will also produce similar results. A blockage could be caused by a collapsed pipe, so the pipe will need to be repaired once the blockage has been removed to fully counter your drainage problem. You should arrange for a professional to survey your drains as soon as you notice any signs of slow drainage. As you might expect, collapsed drains do not work reliably. Depending on the severity of the damage, blockages and sewage backups might be a common problem. If you find that your drains are backing up regularly, a collapsed drain could be the cause. An inspection of your drains should identify any damage or misalignment in your pipes. In particularly severe cases, where the drainage pipe sits underneath structural points of the property, cracks might appear. This could be along the floor or up the walls. This should only occur if a collapsed drain has been left in disrepair for a substantial amount of time, and will be very costly to fix. If your drain runs underneath concrete slabs – such as your driveway or underneath your garage floor foundations – you may find cracks running along the surface of the concrete. Make sure to investigate the problem thoroughly before deciding to simply repair the cracks themselves; they will only reappear over time if the drainpipe remains collapsed. An early sign of a damaged pipe is an odour coming from your drains. You might catch the smell of sewage outside around the drain cover, or inside the house itself. The smell is caused by backups and blockages. If this happens regularly even after the pipe has been cleaned, there is likely a collapse or damage somewhere along the pipe. Following on from the previous sign, a collapsed drain can cause the ground around it to subside or sink over time. This will be one of the more obvious visual signs of a collapsed drainpipe, and one that suggests the pipe has been damaged for quite some time. Subsidence is caused by water leaking from the pipe and into the ground and soil. This can eventually lead to a visible slump or indentation in the ground. Wildon UK are dedicated to keeping your drain running smoothly and efficiently. Our experienced team are equipped with the latest drainage equipment to identify and repair your damaged drains. We operate throughout Stoke on Trent, Staffordshire and the rest of the UK, and are happy to help with any drainage enquiry.